The Spiritual Works of Mercy are acts of compassion by which we help our neighbors with their emotional and spiritual needs. This tradition encompasses the written teachings of the Church (Catholic Social Teaching) but is also broader, including the witness of all Christians and people of faith committed to proclaiming the love of the Gospel and the justice of God’s kingdom in the public sphere. Catholic Social Justice is not a theory or an intellectual exercise, but rather how people of faith are called to live the Gospel in a broken and suffering world. Catholic Social Justice teaches us that all people are made in the image of God and so possess an equal and inalienable worth. Because of this essential dignity, each person has a right to all that is needed to allow him or her to live their full potential as intended by God. As God is love, we were created to love and be in relationship with each other. Human dignity is upheld when each person’s needs are met and when he or she lives in harmony with others in a community that together pursues the common good. Catholic Social Justice teaches us that we have a responsibility to participate in politics out of a concern and commitment to the good of the community. This means that we cannot be bystanders who scoff at the political process. Instead, we are called to vote, to inform ourselves about the issues of the day, to engage in serious conversation about our nation’s future, and to learn to listen to different perspectives with empathy. This responsibility to participate means each person also has a fundamental right to participate, and must be equipped with the resources needed to do so. Catholic Social Justice teaches us to look at reality through the eyes of those who have been made poor by oppression and injustice. We do this when we join together to end poverty. People forced into poverty have the single most urgent claim on the conscience of the nation because they are denied the right to a life consistent with their inalienable dignity. The responsibility to uphold the dignity of each person means that we must judge our lifestyles, policies, and social institutions in terms of how they impact those suffering from the injustice of poverty. Catholic Social Justice teaches us that all people are children of God so every person belongs to a single and interconnected human family. As sisters and brothers, our needs are met in relationship with one another. When making individual and collective decisions, we have a responsibility to consider the good of the whole community over and above the interests of the few. Authorities at every level must work together for the good of the entire community. A just community is united in creating the conditions for every person to flourish and realize their full human potential as children of God. Catholic Social Justice teaches us that work is more than a way to make a living; it is a form of continuing participation in God’s creation. Work should enhance the dignity of the person by allowing all workers to express their uniqueness in a way that contributes to the common good. The community must also recognize the dignity of work by ensuring that it is justly rewarded with a living wage. As human beings are social, they have a fundamental right to organize collectively to create better working conditions for themselves and others. God gave human beings the task of caring for and nurturing all of creation. As human beings are intimately united with all that exists, our health and well-being are dependent upon that of the earth and all its creatures. We must cultivate and care for the earth in such a way that its bounty can provide for and sustain future generations. As creation was entrusted to all of God’s children, all people have an equal right to breathe clean air and drink clean water. Because those on the margins of society are disproportionately affected by environmental degradation, concern for creation is inseparable from concern for justice. Catholic Social Justice is grounded in scripture—in the wisdom of the Hebrew prophets and in the person and teaching of Jesus of Nazareth. The message of the Hebrew prophets was two-fold: to denounce injustice and to announce a new way of being in the world. In the New Testament, when Jesus says “The Spirit of God has anointed me to proclaim liberty to captives” he identifies himself with this prophetic tradition (Luke 4:18). Likewise, as people of faith, we are called to denounce injustices when we see them and announce new, just ways of living together in community. In addition to being grounded in scripture, Catholic Social Justice is shaped by Catholic Social Teaching, the official instruction on social issues from the Pope or Catholic Bishops. In Gaudium et Spes (1965), the Pastoral Constitution on the Church in the Modern World which emerged from the Second Vatican Council, we were called to address global poverty and inequality, saying it is Christians' responsibility to "scrutinize the signs of the times and interpret them in the light of the Gospel" (4). This instruction to face the present situation with courage in order to fight and overcome injustices emphasizes the enduring teachings of the Church throughout the ages. More recently, Pope Francis has breathed fresh life into these teachings by challenging the world to convert from a “throwaway culture” to an economy of inclusion. Catholic Social Justice looks to the public witness of believers who have embodied its principles as additional sources of guidance, inspiration, and instruction. This includes individuals such as Dorothy Day, Cesar Chavez, Rev. Dr. Martin Luther King Jr., Mahatma Gandhi, Rev. Daniel Berrigan, Thomas Merton, and others who show us how people of faith can work to create a just, more peaceful society. Pope Francis said in Evangelii Gaudium, “realities are more important than ideas” (2013). Catholic Social Justice is informed by the prophetic challenge offered by the experience of those suffering from injustice: women, minority communities, the economically exploited, and all whose dignity is denied by unjust systems and structures. Catholic Social Justice witnesses the realities in which people are living and listens to their cries. The method by which we put our faith in action and allow our lived experience to inform our faith is called praxis. 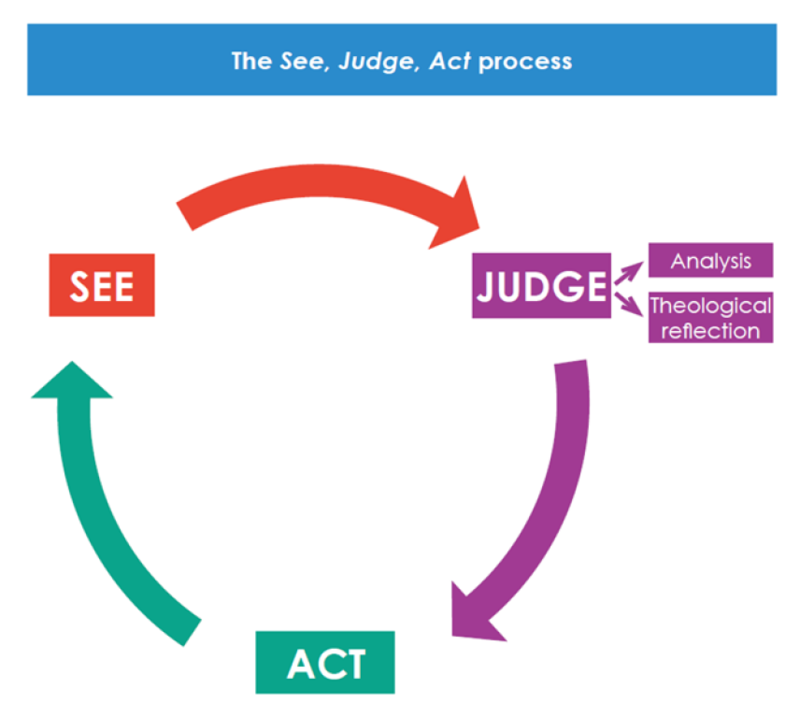 By utilizing the “See, Judge, Act” Method we strive to become contemplatives in action. Seeing, hearing, and experiencing the lived reality of individuals and communities. Naming what is happening that causes you concern. Carefully and intentionally examining the primary data of the situation. What are the people in this situation doing, feeling, and saying? What is happening to them and how do you/they respond? The praxis spiral is a representation of “reflection in action.” It is one way of living the “examined life” that Socrates spoke of when he said, “The unexamined life is not worth living.” The people around the spiral are a representation of both our togetherness as a national and global community and the fact that we are social creatures who need each other’s care and love to sustain us. In the tradition of Catholic social thought, we are always “individuals in community.” The spiral represents the cycle of having an experience and reflecting on that experience, deepening with each rotation. Experience, reflection, and action are part of the same process, one informing the other. The “what” is the experience: What did I experience today, both from the outside and from the inside? What did I see? Hear? Smell? Taste? Touch? Feel? Because we recognize that our lives are a group experience, we begin by bonding with the community of people in our lives. This is an ongoing process, but we need to establish a safe environment around ourselves where people feel open but never forced to share or unjustly excluded. Next, we stay with the experience by using techniques such as the examen and journaling to grasp the “what” and understand our experience on the outside and inside. The “so what” is the reflection, and the process of seeking answers to deeper questions about this experience: So what that I felt this way about this experience? What does it all mean? How can I integrate the experience into the rest of my life? How will the experience change me? This stage involves social analysis. Social analysis is about looking at structures and systems to ask why things are the way they are. Social analysis asks questions of social justice: Who has the power? Who makes decisions? Who will benefit? Who will be harmed? The “now what” leads us back to action. This means we ask questions about our future actions: What do I do concretely as a result of having this experience and reflecting on it? How can I think differently? Are there others that can help me in my efforts? How has my vision of what the world changed through looking more deeply? How do I think or act differently to make this world a better and more just place? 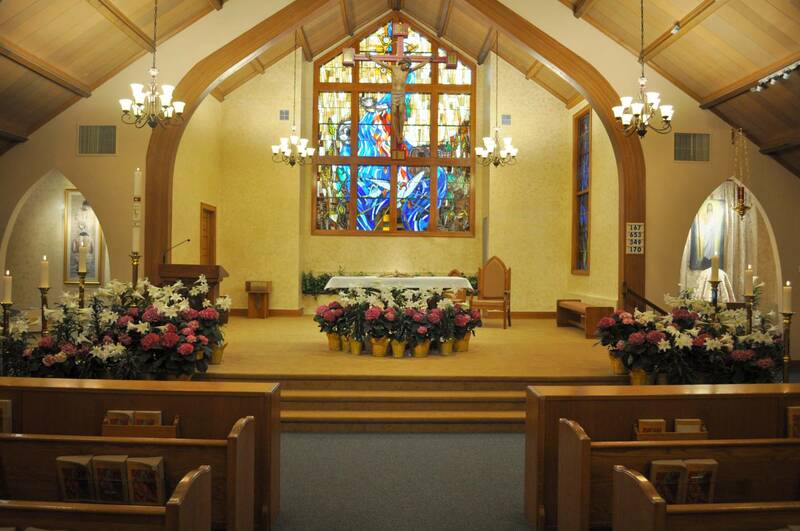 These questions point to the heart of the matter and theological reflection. We discern key experiences (the heart of the matter) and place these experiences in dialogue with where we make meaning, especially religious traditions. This process of making meaning allows us to commit to some kind of action, however small or large. This action leads to another experience, which leads to more social analysis, and the spiral continues to deepen. This process describes what is already going on and also offers us some suggestions about how to do reflection well. The order is generally correct, but the various stages of the spiral are not necessarily sequential, and any stage may be introduced or returned to at any point. Taken as a whole, this process demonstrates: Bonding with People–> Sharing Life Experiences–> Social Analysis–> The Heart of the Matter–> Theological Reflection–> Action and Vision–> The circle begins again.